I wouldn't say I conquered it, but I definitely faced my fear of heights. 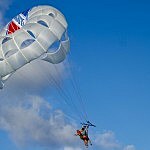 At our stop in Key West, my friends and I decided to do an excursion that included a jet ski trip and para- sailing. I agreed to do it because everyone else was. I kept telling myself you can do it, you can do it! But I was scared to death. The boat ride out there wasn't so bad and watching two other groups go before my friend and I was ok. Right before it was my turn, someone decided to talk about a woman who recently died from para sailing. I am now practically in tears at this point. Well it's my turn. I am literally shaking as I am being strapped in. I take my place at the back of the boat. Before I know it we are up up and away. It wasn't bad. It was actually very beautiful. We started to go higher and higher and the sound of the rope letting out notches had me scared but I did it! I para-sailed and lived to tell about it. Will I ever do it again, I don't know, but it wasn't as bad as I thought. Sometimes you just have to face your fears.